The clustering illusion is the illusion that random events which occur in clusters are not really random events. The illusion is due to a counter-intuitive assumption about statistical odds. For example, it strikes most people as unexpected if heads comes up four times in a row during a series of coin flips. Now if you have got 3 consecutive heads, you’d think next flip can’t be heads, though there is still a 50% probability. Thinking that the probabilities have changed is a common bias. This has caused gamers to lose thinking the probability has changed. 2. Reverse psychology is also known as reactance is the urge to do the opposite of what someone wants you to do out of a need to resist a perceived attempt to constrain your freedom of choice. In fact, reactance theory is sometimes called the “forbidden fruit” theory. 3. Halo effect is otherwise known as Horn’s Effect, devil’s and reverse halo effect is where individuals, brands or other things judged to have a single undesirable trait are subsequently judged to have many poor traits. Allowing a single weak point or negative trait to influence perception of the person, brand or other thing in general. Simplifying it, when we consider a person bad in one area, we are likely to make a similar evaluation in other areas. 4. Pygmalion effect refers to the phenomenon in which the greater the expectation placed upon people, often children or students and employees, the better they perform. The Pygmalion effect is a form of self-fulfilling prophecy, it is a prediction that causes itself to become true. In this respect, people with poor expectations internalize their negative label, and those with positive labels succeed accordingly. For example, you assume you are going to perform badly at your test today so you decrease the effort and end up doing poorly. If I think my relationship with my significant other is going to fail, I start acting differently, pulling away emotionally, which may cause it to fail. 5. Déjà vu literally meaning “already seen”, is the phenomenon of having the strong sensation that an event or experience currently being experienced has already been experienced in the past. The experience is usually accompanied by a strong sense of familiarity and a sense of eeriness, strangeness, or weirdness. The “previous” experience is usually attributed to a dream, but sometimes there is a firm sense that it has truly occurred in the past. Of all the psychological effects ever named, observed, and studied, the overview effect has to be in the running for the least common. 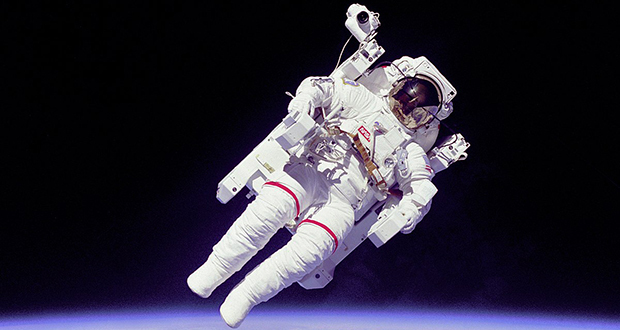 Only astronauts have ever experienced the conditions that lead to it. When astronauts in orbit or on the surface of the moon first see the Earth in its entirety, many reports feeling a deep sense of scale and perspective that has come to be called the overview effect. The effect can be deeply moving, confusing, inspiring, and emotionally challenging, as a view of the entire Earth changes one’s perspective in a profound way. Astronauts have returned home with a renewed sense of the way we’re all connected, of the relative meaninglessness of cultural boundaries, and a desire to take care of the Earth’s environment. 7. In social psychology, the pratfall effect is the tendency for attractiveness to increase or decrease after an individual makes a mistake, depending on the individual’s perceived ability to perform well in a general sense. A perceived able individual would be, on average, more likable after committing a blunder, while the opposite would occur if a perceived average person makes a mistake. 8. Bystander effect also known as bystander apathy, is a social psychological phenomenon that refers to cases in which individuals do not offer any means of help to a victim when other people are present. The probability of help is inversely related to the number of bystanders. In other words, the greater the number of bystanders, the less likely it is that any one of them will help. 9. Spotlight effect is the tendency to overestimate the amount that other people notice your appearance or behavior. The reasoning behind the spotlight effect comes from the innate tendency to forget that although one is the center of one’s own world, one is not the center of everyone else’s. Many professionals in social psychology encourage people to be conscious of the spotlight effect and to allow this phenomenon to moderate the extent to which one believes one is in a social spotlight. 10. Anchoring or Focusing effect is a cognitive bias that describes the common human tendency to rely too heavily on the first piece of information offered (the “anchor”) when making decisions. During decision making, anchoring occurs when individuals use an initial piece of information to make subsequent judgments. For example, the initial price offered for a used car sets the standard for the rest of the negotiations, so that prices lower than the initial price seem more reasonable even if they are still higher than what the car is really worth. The cocktail party effect is the phenomenon of being able to focus one's auditory attention on a particular stimulus while filtering out a range of other stimuli. The effect enables people to talk in noisy locations. For example, when conversing at a musical concert, people can listen to the band and understand a friend all at the same time. They can also simultaneously ignore loud noises. Nevertheless, if someone calls out your name from across the room, people will notice. 12. Online disinhibition effect refers to the way people behave on the internet with less restraint than in real-world situations. Many people change their natural behavior online. It is an extremely powerful cognitive phenomenon that is represented by the loosening of social restrictions and inhibitions that would otherwise be present in normal face-to-face interaction. Because of the loss of inhibition, some internet users show extreme and emotional tendencies. Some people will become more affectionate and less guarded, speaking out to others about their feelings in an attempt to achieve emotional catharsis. 13. Illusory superiority is a cognitive bias that causes people to overestimate their positive abilities and underestimate their negative qualities in relation to others. It is a positive illusion that has been studied extensively in social psychology. Positive illusions have been described as human’s unrealistically favorable attitude toward themselves. There are three broad categories of positive illusions, inflated assessment of one’s own abilities, unrealistic optimism about the future and an illusion of control. Illusory superiority is often referred to as the above average effect. The above-average effect states that people regard themselves more positively and less negatively than others actually perceive them. 14. Cognitive dissonance is perhaps one of the weirdest and most unsettling findings in psychology. It is the idea that we find it hard to hold two contradictory beliefs, so we unconsciously adjust one to make it fit with the other. In the classic study, students found a boring task more interesting if they were paid less to take part. Our unconscious reasons like this: if I didn’t do it for money, then I must have done it because it was interesting. As if by magic, a boring task becomes more interesting because otherwise, I can’t explain my behavior. 15. Tetris effect is where a person devoting a large amount of time to a particular pattern-based activity (which in this case is Tetris) will start unconsciously thinking and dreaming about it. People who played Tetris for a prolonged amount of time could find themselves thinking about ways different shapes in the real world can fit together, such as the boxes on a supermarket shelf, the buildings on a street, or hallucinating pieces being generated and falling into place on an invisible layout. 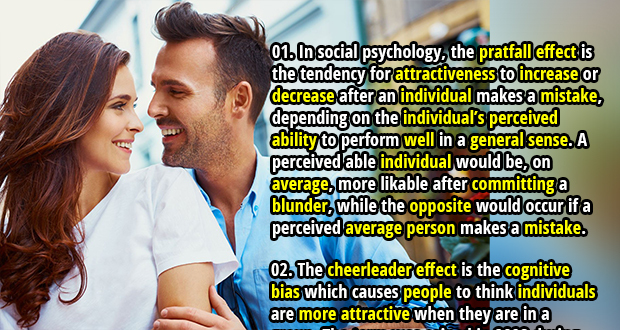 The cheerleader effect, also known as the group attractiveness effect is the cognitive bias which causes people to think individuals are more attractive when they are in a group. The term was coined in 2008 during the How I Met Your Mother episode “Not a Father's Day”, and has been backed up by clinical research by Drew Walker and Edward Vul. The effect occurs because of the brain’s tendency to calculate the average properties of an object when viewing a group. 17. The backfire effect occurs when, in the face of contradictory evidence, established beliefs do not change but actually get stronger. The effect has been demonstrated experimentally in psychological tests, where subjects are given data that either reinforces or goes against their existing biases and in most cases people can be shown to increase their confidence in their prior position regardless of the evidence they were faced with. 19. In social psychology, social loafing is the phenomenon of people exerting less effort to achieve a goal when they work in a group than when they work alone. A researcher in the 1970s blindfolded participants and told them they were going to play tug-of-war against another team. When they were told they had 3 others pulling with them, they pulled 18% less strenuously than when they were told they were alone. 20. Semantic satiation is the psychological phenomenon in which repetition causes a word or phrase to temporarily lose meaning for the listener, who then processes the speech as repeated meaningless sounds. It is especially noticeable if you repeat a strange word several times to yourself in order to get the pronunciation right and the accent on the correct syllable and it ends up sounding stranger and stranger the more you try before becoming complete nonsense to your ears. 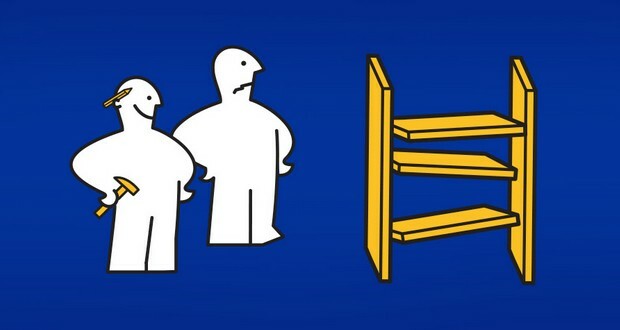 IKEA effect is the tendency for people to place a disproportionately high value on objects that they partially assembled themselves, such as furniture from IKEA, regardless of the quality of the end result. 22. The broken escalator phenomenon, also known as the Walker Effect, is the sensation of losing balance or dizziness reported by some people when stepping onto an escalator which is not working. It is said that there is a brief, odd sensation of imbalance, despite full awareness that the escalator is not going to move. 23. Google effect is a cognitive bias where a person tends to forget information that can easily be found using internet search engines. 24. Cryptomnesia is a memory bias whereby a person may falsely recall generating a thought, an idea, a song, or a joke, not deliberately engaging in plagiarism but rather experiencing a memory as if it were a new inspiration. 25. Functional fixedness is a cognitive bias which limits a person to using an object only in the way it is traditionally used. For example, if someone needs a paperweight, but they only have a hammer, they may not see how the hammer can be used as a paperweight. Functional fixedness is this inability to see a hammer’s use as anything other than for pounding nails; the person couldn't think to use the hammer in a way other than in its conventional function.